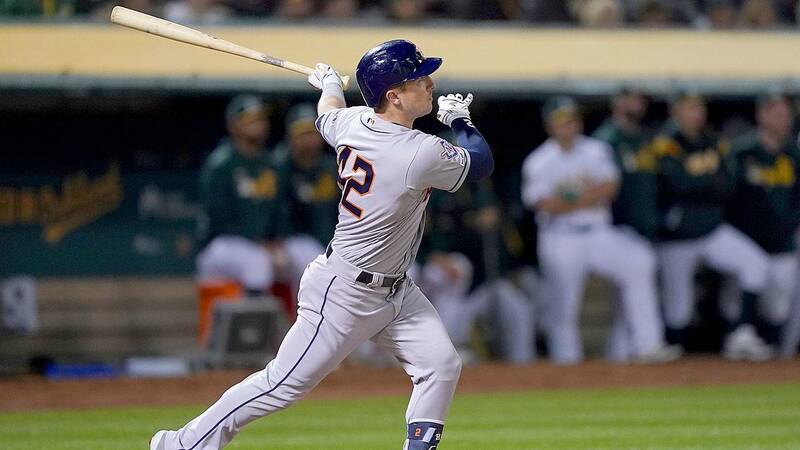 Alex Bregman, of the Houston Astros, swings at a pitch during a game against the Oakland A's in Oakland, California, on April 16, 2019. OAKLAND, Calif. - Collin McHugh has had a few close calls on the mound - nothing like this line drive he somehow dodged with an acrobatic maneuver that allowed the Astros to turn a nifty double play behind him. The ball hit by Kendrys Morales in the second inning of Houston's 9-1 win against the Athletics on Tuesday night skimmed in front of McHugh's face as his body bent backward and went parallel to the ground, reminiscent to the old Limbo dance. The ball touched the tip of the pitcher's ring finger, a much better option than his head or jaw - "probably the best place it could have hit me." Reddick finished with three hits as Houston improved to 4-0 against the A's so far. The Astros have won eight of 10 in Oakland - and their 7-2 mark in 2018 at the Coliseum was the A's worst home record in the rivalry for one season.